Before you disregard Killing Floor: Incursion as just another VR zombie shooter, let me make some things clear. You’re not stationary, like in The Brookhaven Experiment and countless other VR shooters. You’re not simply killing waves of zombies, although those do exist. And you are in fact playing the game, in multiplayer, with other people by your side. There are puzzles. Environments are large and full of both nooks and crannies to explore. It’s more than what you may be used to with this genre. When described that way, you can see how Killing Floor: Incursion is actually much different than most of the other contemporary zombie shooters in VR, right? When I got my hands on the game through an Oculus Rift and Touch controllers I was joined by one of the developers. We took on the role of two elite Horzine Security Forces soldiers and we set off into the darkness, pistols drawn, ready to face off against armies of the undead. 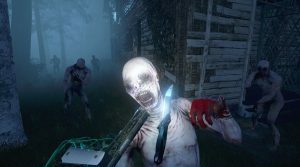 The Killing Floor franchise made a name for itself on PC by taking the concept behind popular zombie survival modes, and expanding them into its own standalone game. However, whereas Killing Floor and its upcoming sequel are mostly known for endless waves and brutal violence, Incursion, this upcoming VR spinoff, is something a bit different. The voiceover inside my headset told me I was to inspect an old, decrepit house to track down some mystical objects. Once I got onsite, it was clear it wasn’t going to be a simple mission. Zombies started to appear, descending on our location. With a mixture of taking them out with my pistol and slashing off their heads with my knife, I was able to keep them at bay. My game-developer-partner even walked me through how I could clip my flashlight to my chest to ensure I never had to venture too far into the darkness. The first thing I noticed was how satisfying the gunplay felt and how visceral melee combat is. For VR games, dealing with up-close violence is often tricky, but putting that brutality in the hands of players and empowering them to fight back does wonders for enhancing a gameplay experience. This is accentuated by the breathtaking visuals that do more than an admirable job of giving me both goosebumps and fright-chills when I see the next mammoth creature stumbling towards me. Since the game is not stationary like so many other VR wave shooters, it employed the oft-used teleportation-based locomotion system. Throughout the environments I found health packs and ammo crates as well and the incentive to explore will surely be even stronger once the full game releases. And as you can tell from the trailer and screenshots included in this preview, the enemy designs are downright terrifying. The way they stalk and move through the world and emit horrible grueling sounds as you strike them down is unnerving. The power of 3D spatial 360-audio is truly on display best within action horror games such as Killing Floor: Incursion. My short preview was only a single map that tasked us with rearing a portal of some kind on a wall — the broken pieces were scattered around the house — so it’s hard to say what else is in store for future environments. Each map is custom-made and not procedurally generated, although the placement, spawns, and ferocity of the zombies is random. Back when Killing Floor: Incursion was originally announced at E3, we knew very little about the game. As it turns out, the large environments, co-op killing, and horrifying zombie action the series has been known for will make the transition over to the immersive medium of virtual reality. Killing Floor: Incursion is expected to release later this year for Oculus Rift with Touch. You can find more information about the game at the official website.